The mob attack on Fox News host Tucker Carlson’s home this week by radical Marxists – leaving his home with a broken door and vandalized with leftist slogans – has triggered widespread shock on the part of most decent Americans. For those aware of the way “Antifa” elements operate internationally, however, the incident was nothing new. In the past several years, since dictator Raúl Castro took over for late dictator brother Fidel, Cuba has endeavored to export the practice of actos de repudio, attacking the presence of dissidents at international summit events, violently beating them in public on foreign soil, and even using mob behavior to silence American diplomats at the United Nations. The incident this week organized by a violent group calling itself “Smash Racism DC” is evidence that, at least among the American left, Cuba’s campaign is succeeding. The protesters can be heard chanting “Tucker Carlson, we will fight. We know where you sleep at night.” The video shows only the early part of the protest, omitting the violence that followed. Carlson was not home at the time of the attack. “I called my wife. She had been in the kitchen alone getting ready to go to dinner and she heard pounding on the front door and screaming. … Someone started throwing himself against the front door and actually cracked the front door,” Carlson told The Washington Post. According to the official police report, the mob vandalized the Carlson home, driveway, and the car parked there by scrawling various leftist messages all over them. The mob also broke the front door, nearly managing to enter the home to presumably hurt Carlson’s family. Washington, DC, police are investigating the incident as a hate crime. Carlson accurately described the attack as an attempt to silence his political thoughts in a subsequent interview Thursday night on Fox News. “What’s it like to find out that your wife is hiding in the pantry because people are threatening her? I mean, it’s upsetting,” he noted. With some notable exceptions on the far left, mainstream political observers have condemned the attack as fundamentally anti-American and argued that such mob tyranny is a scary new development in political speech, practically unprecedented. 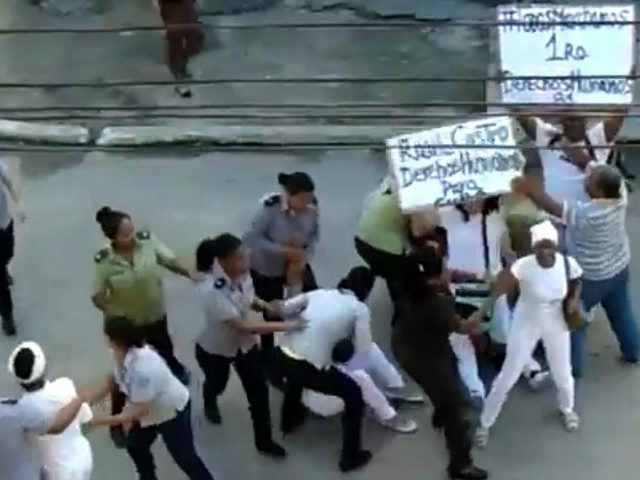 Those who view this as a novel threat have clearly not studied the Ladies in White, a group of pro-democracy peace activists in Cuba who experience some form of this harassment on a weekly basis. Unlike the Antifa event, the Ladies in White, and in particular their leader Berta Soler, face similar attacks organized and funded by their own government. The women, whose sole act of protest is to attempt to go to Catholic Mass on Sundays, have faced beatings, stoning, tarring at the hands of these mobs. In a memorable 2016 acto de repudio, a mob made a bonfire out of copies of the United Nations Universal Declaration of Human Rights as a reminder that its ideals do not apply to them. The attacks are not limited to political opponents. Below is a mob attack against Tania Bruguera, a Cuban artist who courted the ire of the regime by planning an art installation consisting only of a microphone placed in the Plaza of the Revolution in Havana for the use of anyone in the public to say whatever they want. Bruguera has an official Cuban police officer assigned to monitor her at all times. In 2015, the Cuban government decided to begin exporting actos de repudio after being invited to the Summit of the Americas for the first time. At the time, Latin American leaders like Venezuelan dictator Nicolás Maduro, corrupt Brazilian socialist Luiz Inácio Lula da Silva, and similarly corrupt Argentine former President Cristina Fernández de Kirchner hijacked the summit to invite Cuba despite the nation not meeting the Organization of American States’ democracy requirements. The Cuban state agents used the invitation to stage actos de repudio in Panama. The agents physically beat a small group of dissidents who gathered to honor Cuban founding father José Martí in Panama City. Facing no repercussions, the Cuban delegation at the 2018 Summit of the Americas in Perú similarly used mob tactics to silence pro-democracy voices – this time, rather than doing so at an unofficial event, orchestrating an acto de repudio at the site of the summit. The international community failed to shut it down. So, last month, the Cubans did it again, organizing a loud, angry mob to yell over American diplomats discussing human rights at the United Nations headquarters in New York. The United Nations refused to remove the mob, so they continued to make noise for nearly an hour. Clearly, someone at “Smash Racism DC” thought that, if the policy has worked for the Castro regime, it might work for them. The extensive, repulsive history of mob attacks in Cuba similar to what Carlson experienced – and their increased frequency abroad since 2015, when the Obama administration flooded Cuba with foreign investment in return for nothing – is a reminder that interacting with foreign regimes does not necessarily make them freer. Sometimes, values flow in the opposite direction, resulting in authoritarian minorities in the free country becoming emboldened and infected with the same tactics common in the repressive regime. Antifa groups adopting Cuban state tactics is little different than watching Silicon Valley tech companies growing to prefer communist China’s approach to internet censorship to America’s longstanding respect for individual expression after years of China economic favoritists insisting that enriching the Communist Party will somehow make China “freer.” The abyss always looks back into you. The attack on Carlson’s family should not be a surprise and will not be the last of its kind. Understanding the historical and global context of the leftists who orchestrated it, however, is indispensable to protect the uniquely American right-wing morality that leads to rejecting such behavior.